February 5, 2019: Non-subscriber update. Subscribers, see the update below this one. Rain chances. WeatherTalk monthly operating costs can top $2000.00. Your $5 subscription helps pay for those costs. I work for you. The $5 will allow you to register up to seven phones! For $5 a month you can receive the following. You may choose to receive these via your WeatherTalk app or regular text messaging. 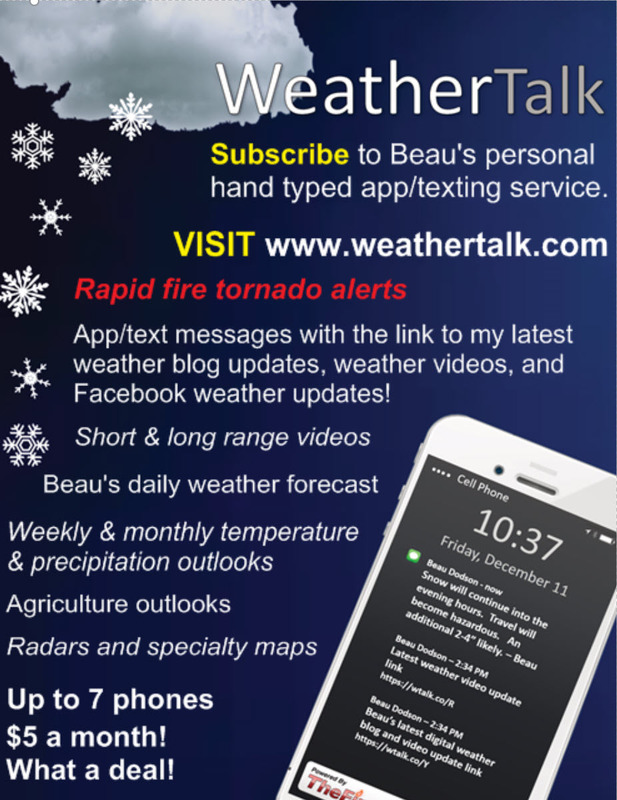 Severe weather app/text alerts from my keyboard to your app/cell phone. These are hand typed messages from me to you. During tornado outbreaks, you will receive numerous app/text messages telling you exactly where the tornado is located. Daily forecast app/texts from my computer to your app/cell phone. Social media links sent directly to your app/cell phone. When I update the blog, videos, or Facebook you will receive the link. AWARE emails. These emails keep you well ahead of the storm. They give you several days of lead time before significant weather events. Direct access to Beau via text and email. Your very own personal meteorologist. I work for you! Week one, two, three and four temperature and precipitation outlooks. Your subscription also will help support several local charities. 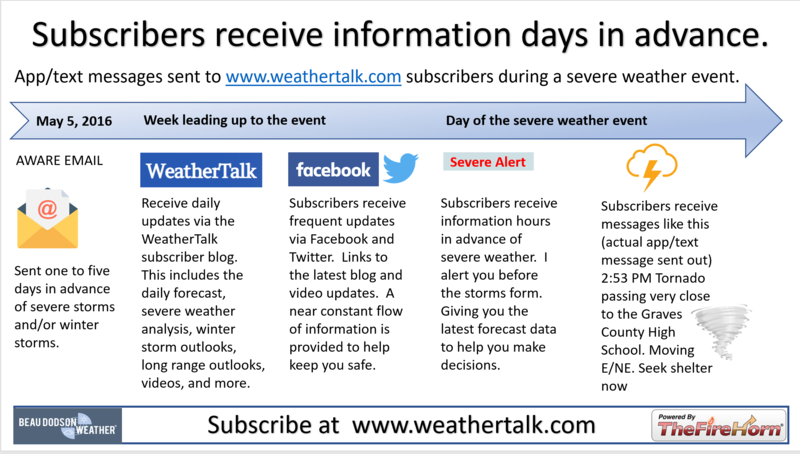 Typical progression on a severe weather day for subscribers. I encourage subscribers to use the app vs regular text messaging. We have found text messaging to be delayed during severe weather. The app typically will receive the messages instantly. I recommend people have three to four methods of receiving their severe weather information. Remember, my app and text alerts are hand typed and not computer generated. You are being given my personal attention during significant weather events. WWW.WEATHERTALK.COM subscribers, here is my day to day schedule for your weather products. These are bonus videos and maps for subscribers. I bring these to you from the BAMwx team. I pay them to help with videos. The Ohio and Missouri Valley videos cover most of our area. They do not have a specific Tennessee Valley forecast but may add one in the future. The long-range video is technical. Over time, you can learn a lot about meteorology from the long range video. Just keep in mind, it is a bit more technical. This product is for subscribers. Tuesday’s Forecast: Patchy fog and mist. Widespread clouds. A chance of widely scattered showers. Isolated thunderstorms. The region will be split between warm and cool. Note, what does the % chance actually mean? A 20% chance of rain does not mean it won’t rain. It simply means most areas will remain dry. What impacts are anticipated from the weather? A few wet roadways. Isolated lightning. Low visibility in fog. Tuesday night Forecast: Patchy fog. Cloudy with widespread rain showers developing. A thunderstorm possible. Mild for February. Breezy, at times. What impacts are anticipated from the weather? Wet roadways. Isolated lightning. Low visibility in fog. Wednesday’s Forecast: Showers and thunderstorms. Locally heavy rain. A few storms could be strong. Is flash flooding anticipated? Low risk of flash flooding. Some general flooding is possible this afternoon. Is severe weather expected? Possible. High wind is the main concern. A low-end tornado risk. Overall confidence in severe weather is fairly low. What impacts are anticipated from the weather? Moderate rain. Lightning. Monitor severe weather concerns. Wednesday night Forecast: Rising temperatures overnight as a warm front moves northward. Showers and thunderstorms. Locally heavy rain. A strong thunderstorm is possible. Mild. Breezy. Is flash flooding anticipated? Possible. Is severe weather expected? Monitor updates. Strong thunderstorms can’t be ruled out. High wind is the main concern. Isolated tornado risk. Overall confidence in severe weather is fairly low. What impacts are anticipated from the weather? Heavy rain. Lightning. Gusty winds. Monitor severe weather concerns. Should I cancel my outdoor plans? Have a plan B.
Thursday’s Forecast: Showers and thunderstorms. Heavy rain is possible. Mild. Monitor the risk of a few strong thunderstorms. Windy. Turning colder as the front moves east. Is flash flooding anticipated? Yes. Is severe weather expected? Yes. There is a risk of severe weather. The main concern will be during the AM hours. What impacts are anticipated from the weather? Heavy rain. Flooding or flash flooding. Lightning. Gusty winds. Monitor the threat of severe weather. Thursday night Forecast: Rain ending west to east. Sharply colder. A small chance of flurries as the colder air arrives. Watch for black ice in areas where moisture remains as the cold air arrives. Wind direction and speed: Becoming west and northwest at 15 to 30 mph and gusty. Coverage of precipitation: Ending west to east. Are icy road conditions anticipated? Unlikely. Watch for black ice in areas where moisture remains as the cold air arrives. Is lightning anticipated? Perhaps early. Most likely the lightning concerns will be over with. What impacts are anticipated from the weather? Wet roadways. Watch for black ice in areas where moisture remains as the cold air arrives. Friday’s Forecast: Mostly sunny and colder. Friday night Forecast: Mostly clear and cold. Saturday’s Forecast: Partly sunny. Cold. Wind direction and speed: Northeast at 5 to 10 mph. Saturday night Forecast: Increasing clouds. A slight chance of light snow late. What impacts are anticipated from the weather? Most likely none. Monitor updates. Sunday’s Forecast: Mostly cloudy with snow or rain showers possible. Any snow would turn to all rain as temperatures rise. What impacts are anticipated from the weather? Wet roadways. Monitor the AM hours in case the snow accumulates (briefly). Should I cancel my outdoor plans? Have a plan B and monitor updates. 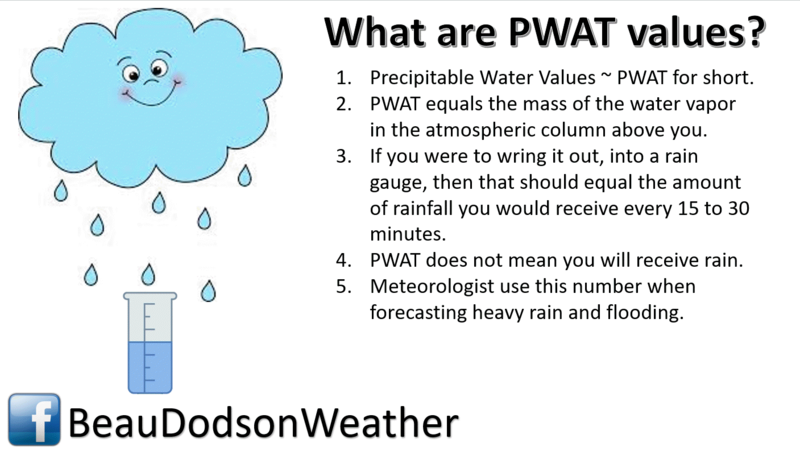 Some question on the timing of the precipitation. Sunday night Forecast: Cloudy with rain showers. 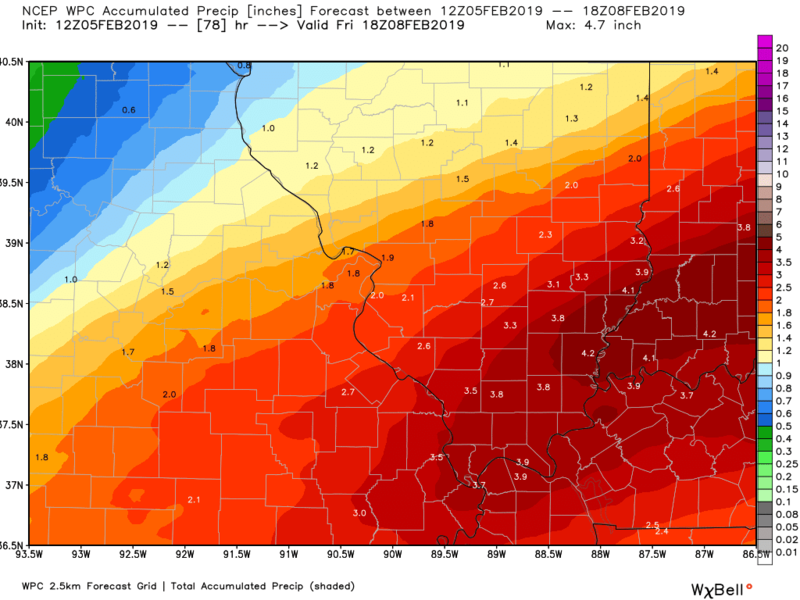 Small chance of a rain / snow mix over northern parts of southern Illinois. This appears to be mostly a rain event. Will non-accumulating snow or ice occur? Low risk of a rain / snow mix over our far northern counties. What impacts are anticipated from the weather? Wet roadways. Should I cancel my outdoor plans? Monitor updates. Monday’s Forecast: Cloudy with rain showers. What impacts are anticipated from the weather? Wet roadways. Monitor the risk of flooding. Monday night Forecast: Cloudy. Rain likely. What impacts are anticipated from the weather? Wet roadways. Patchy fog. Monitor the risk of flooding. Tuesday’s Forecast: Cloudy with rain showers. Tuesday night Forecast: Cloudy. Rain showers. Learn more about the UV index readings. Click here. The wind speed and direction forecast. Today through Thursday: Winter weather is not anticipated. Thursday night through Sunday: Monitor updates. Rain may end as light snow Thursday night. No accumulation, if it occurs at all. I am also watching late Saturday night into Sunday morning. 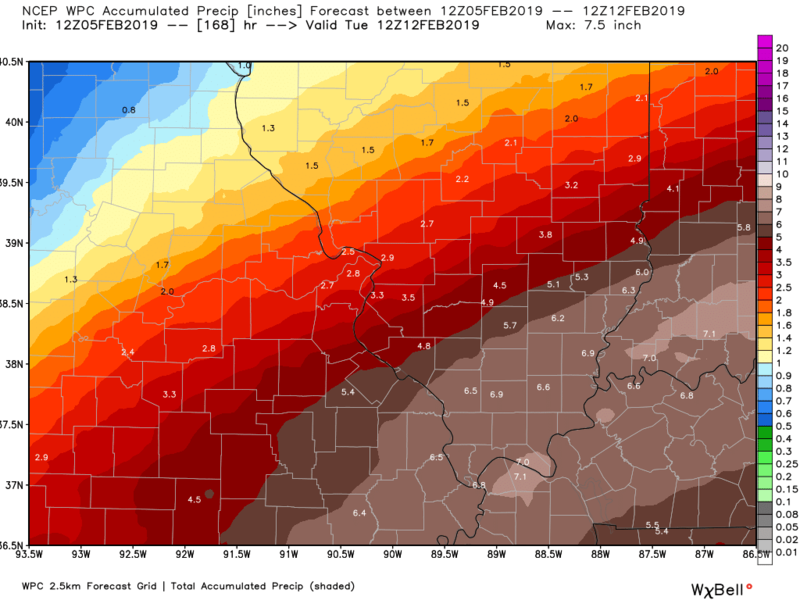 We could have some additional precipitation. Perhaps a wintry mix changing to all rain. 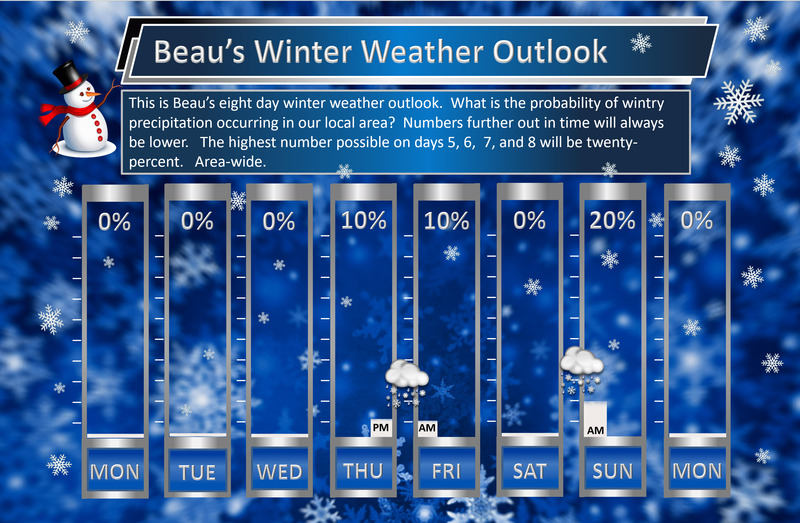 Beau’s exclusive eight-day winter weather outlook! The highest number possible on days 5, 6, 7, and 8 will be twenty-percent. Here is the latest graphic from the WPC/NOAA. This map shows you liquid and does not assume precipitation type. In other words, melted precipitation totals. Locally heavy rain is possible Wednesday into Thursday evening. This is the seven-day image. This includes two events. This is for event number one. This takes us into Friday morning. When you add in the other event (later this weekend) you end up with some big totals. Let’s hope this does not verify. This is now through Friday. Most of this occurs from Wednesday into Thursday. 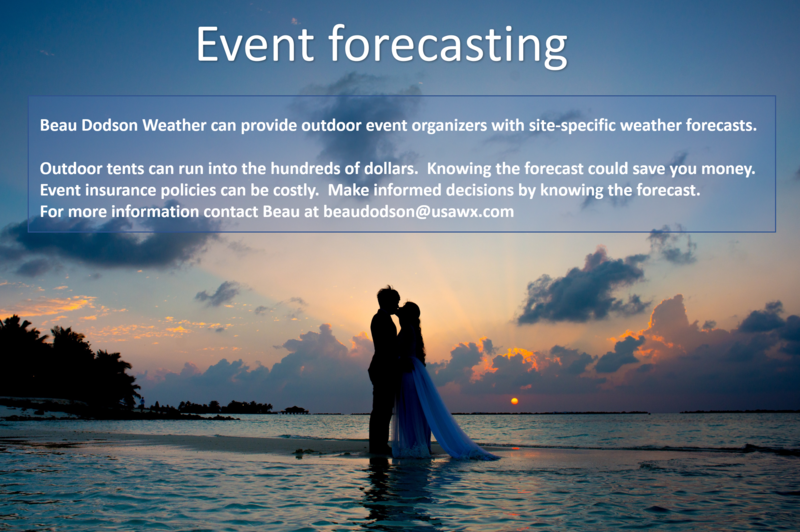 Subscribers, do you need a forecast for an outdoor event? 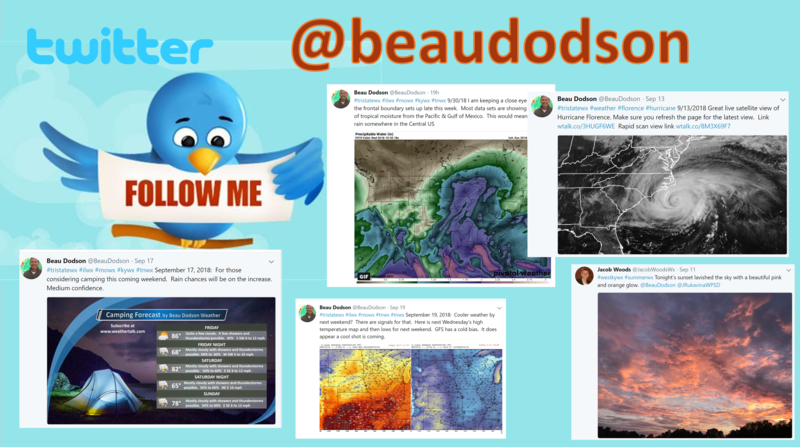 Did you know that you can find me on Twitter? Click here for your interactive local city-view radars & regional radars. During winter weather be sure and click the winterize button above each city-view radar. This will show you the precipitation type. The National Weather Service defines a severe thunderstorm as one that produces quarter size hail or larger, 58 mph winds or greater, and/or a tornado. Today through tonight: No severe weather concerns. A few reports of lightning possible this afternoon and tonight. Wednesday into Thursday: Monitor updates. Lightning is possible. I am monitoring the risk of strong thunderstorms from Wednesday afternoon and Wednesday night. Confidence in severe weather occurring is low. 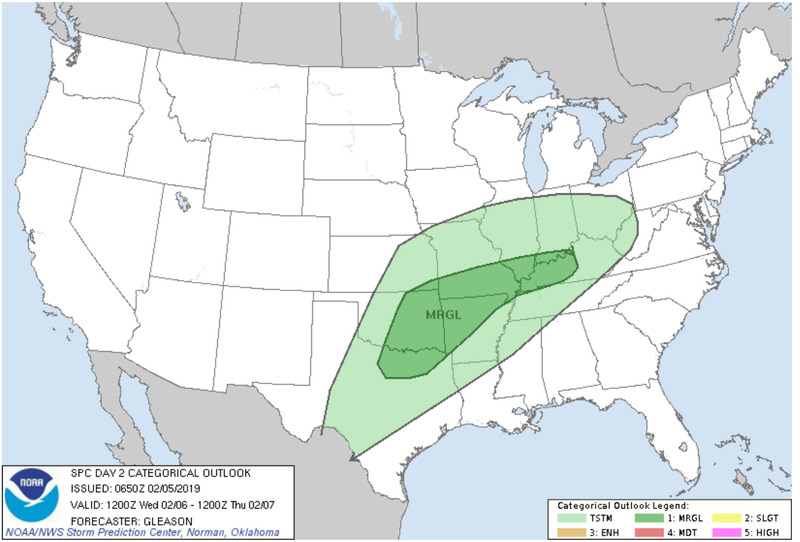 Thursday night into Monday: No severe weather concerns. 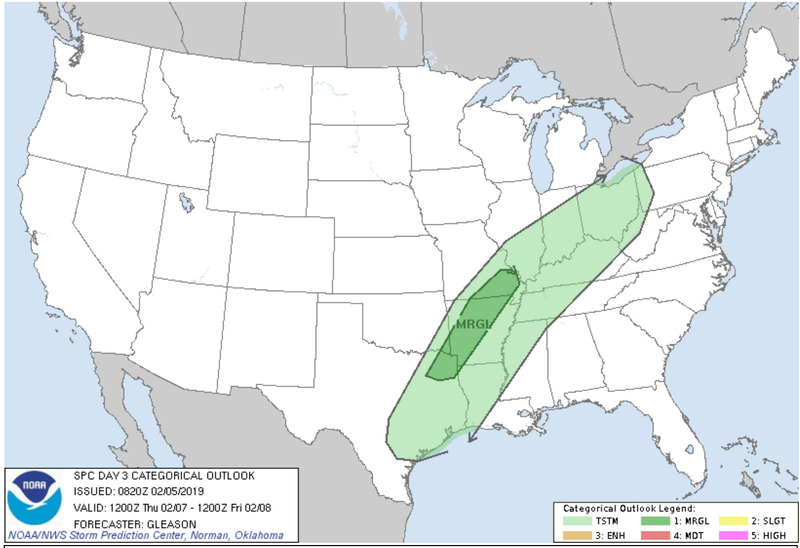 Here is the SPC outlook for tomorrow and Thursday. Light green represents non-severe storms. Dark green represents a marginal (level one out of five) risk. Interactive live weather radar page. Choose the city nearest your location. If one of the cities does not work then try a nearby one. Click here. National map of weather watches and warnings. Click here. Storm Prediction Center. Click here. Weather Prediction Center. Click here. Live lightning data: Click here. Interactive GOES R satellite. Track clouds. Click here. Here are the latest local river stage forecast numbers Click Here. Here are the latest lake stage forecast numbers for Kentucky Lake and Lake Barkley Click Here. 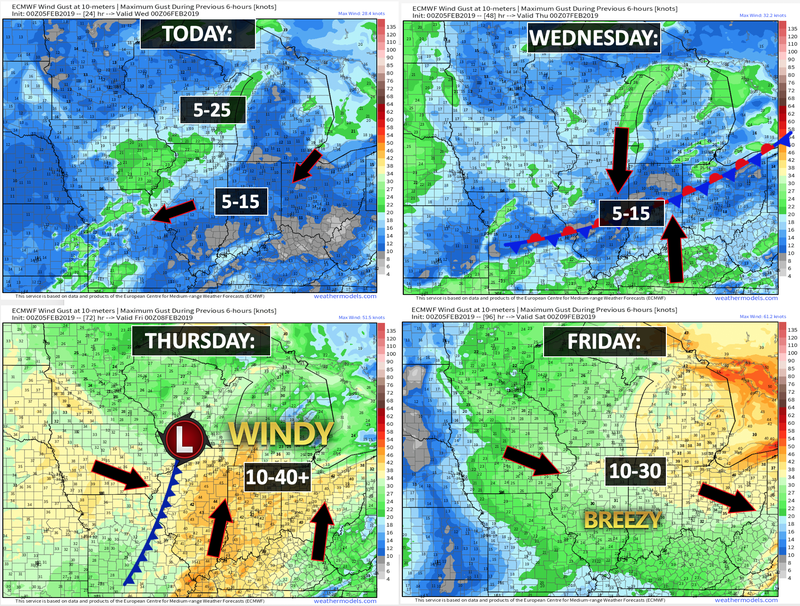 Widespread rain will develop over the next three days. Some thunderstorms, as well. Concerns about flash flooding and river flooding are increasing. Flash flood and/or flood watches will likely be issued for portions of the region later this week. Changes over the last 24 hours. No major adjustments. I did add a chance of thunder into the afternoon forecast. Many areas may remain mostly dry today. Overall confidence in today’s forecast through Monday is medium to high. Monitor updates. Flash flood or flood watches may need to be issued for portions of the region by Wednesday into Thursday evening. A few severe thunderstorms can’t be ruled out. The main concern will be Wednesday afternoon and Wednesday night. Smaller risk on Thursday. 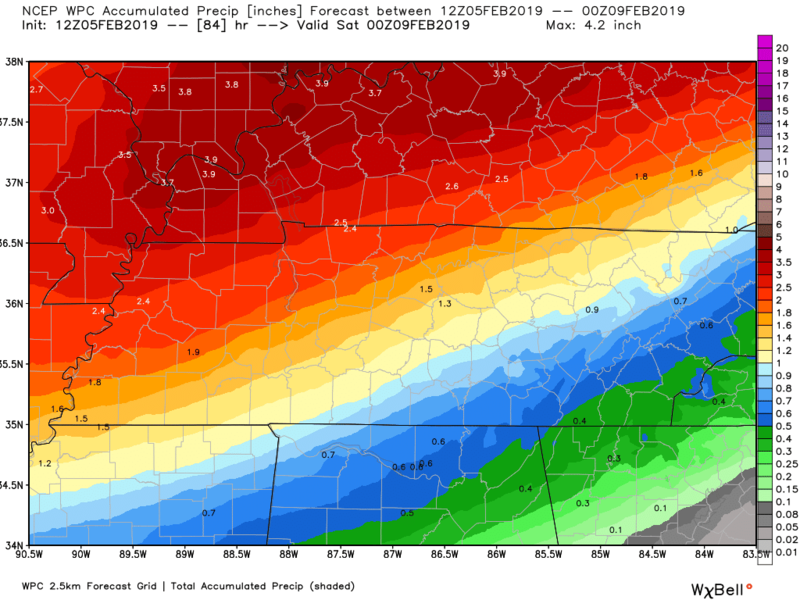 The heaviest rain will occur Wednesday night and Thursday. As mentioned, my main weather concern centers around the heavy rain event that is developing. 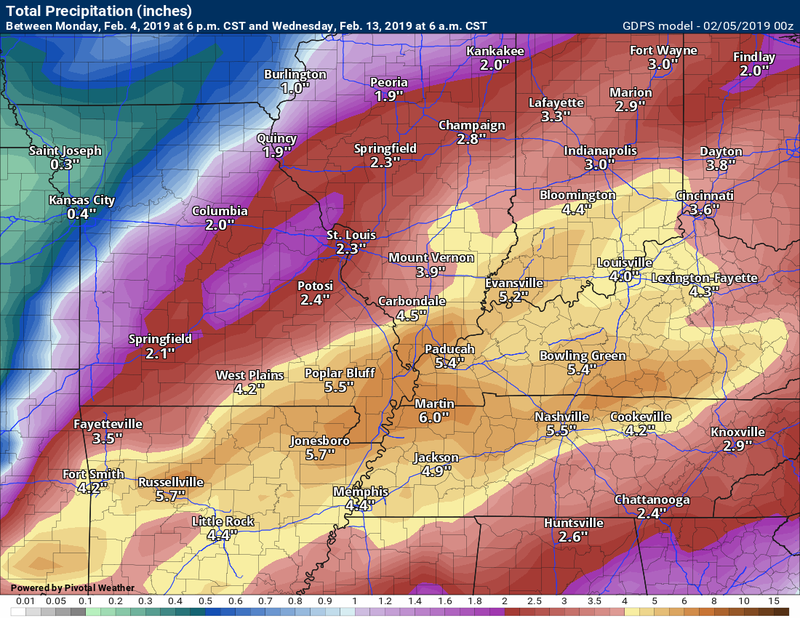 Over the next seven days, portions of the region may receive more than five inches of rain. Needless to say, we do not need all of this rain. 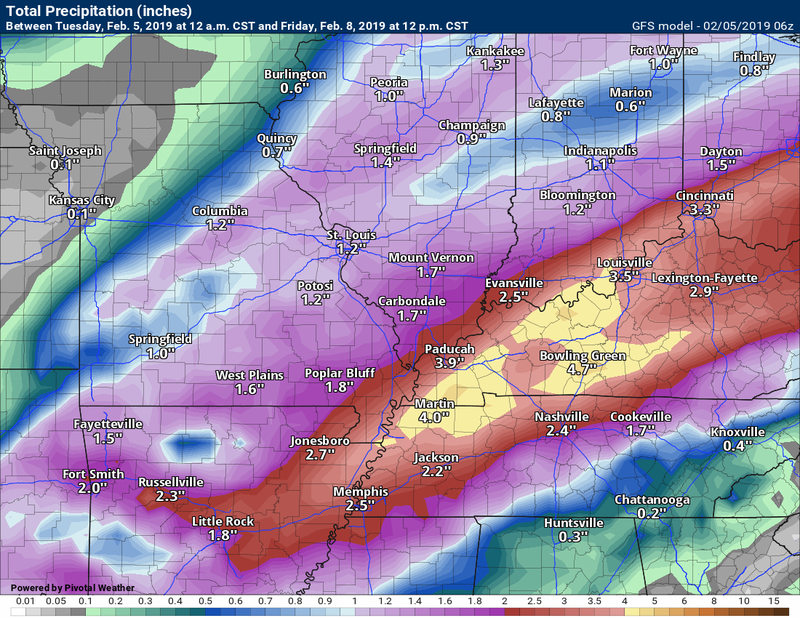 Some of the guidance even indicates five to eight inches of rain along the Ohio River. You can expect significant rises on area streams and lakes. Thunderstorms are possible over the coming days, as well. 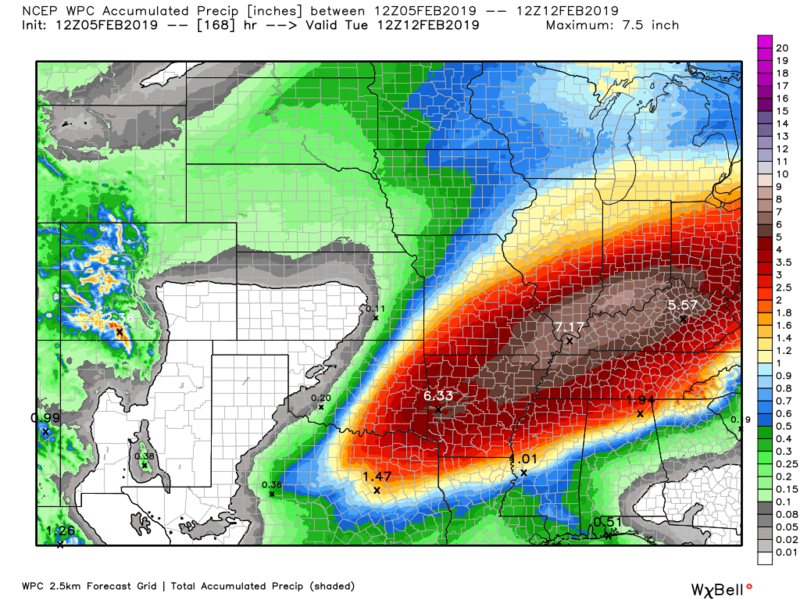 Those thunderstorms will enhance rain totals. Thunderstorms will increase the risk of flooding. General flooding can be expected as ditches, streams, and rivers rise. Avoid flooded roadways. 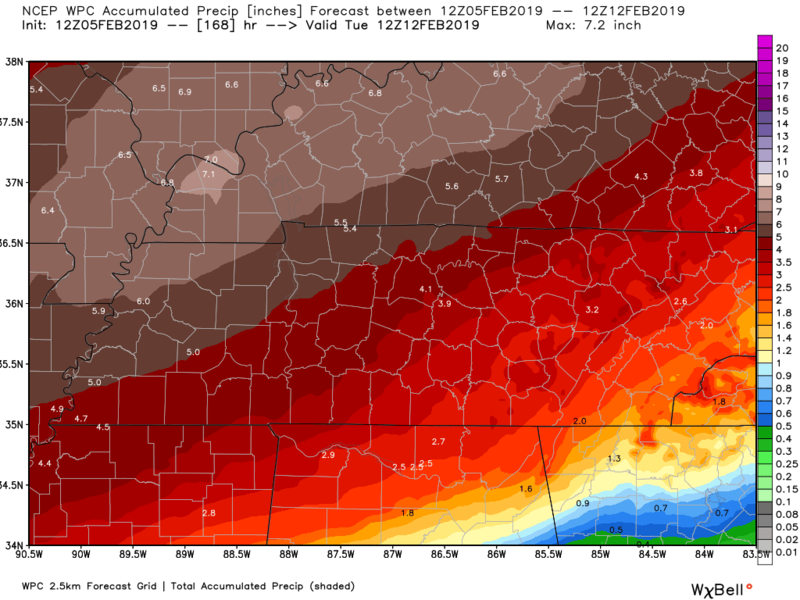 The heaviest rain will arrive Wednesday night into Thursday. We also have another rain event that will develop Sunday and Monday. That could begin as a wintry mix before changing to all rain. We also have a risk of a few severe thunderstorms Wednesday afternoon and Wednesday night. There will be plenty of clouds and ongoing rain. There remain questions about just how unstable the atmosphere will become. It is possible that no severe weather develops. This is a portion of the forecast that I will be monitoring. Of course, I will be updating the blog, Facebook, and I will send out app messages. Make sure you have WeatherOne turned on. That is the most important app/text message. That is the one for tornadoes. 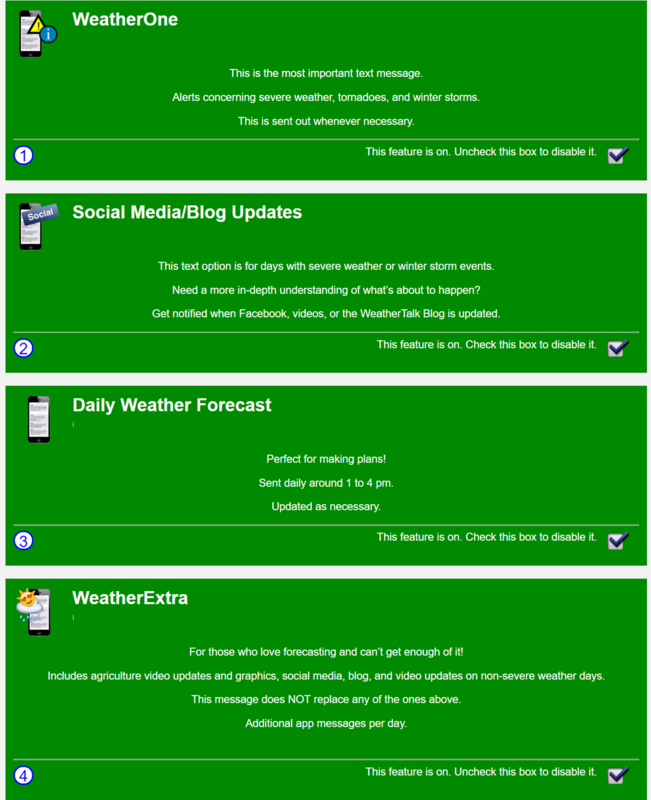 Log into your www.weathertalk.com account. Click the personal notification settings tab. Turn on WeatherOne. It will be green if it is on. It will be red if it is off. A few showers are also possible today. Many areas will remain cloudy and dry. There will be just enough instability to cause a few flashes of lightning, as well. We have a front dividing the region. Temperatures will remain in the 40’s over the northern half of the region and jump to 60 degrees from the Missouri Bootheel along the Kentucky/Tennessee border. That front will push northward tonight. That will spread warm and moist air back into the entire region. Unseasonably mild air. You can see some spotty showers here on the Hrrr future-cast radar model guidance. The timestamp is located in the upper left portion of the animation. See our local city-view radars for live data. Click here for your interactive local city-view radars & regional radars. You can see a few little showers dotting radar today. Patchy fog and drizzle north of the front will also occur. Green is rain. Yellow represents moderate rain. The splashes of red represent freezing rain. Locally, we will not have to worry about freezing rain. It will be too warm. 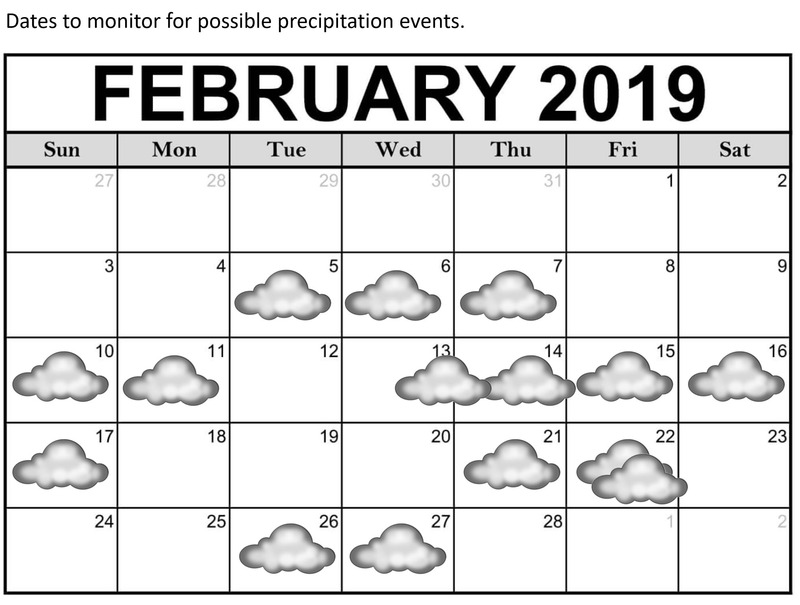 February was forecast to be a roller-coaster ride in the temperature department. We have large temperature swings ahead of us, as well. The timestamp is located in the upper left portion of the animation. A large spread of temperatures across the region today. There is a front in there! Widespread rain will develop tonight and continue into Wednesday, Wednesday night, and Thursday. Rain will end Thursday night. I can’t rule out the rain ending as snow. At this time, accumulation appears unlikely. Let’s look at some more future-cast radar images. This is the NAM model guidance. Again, the timestamp is located in the upper left. Red is freezing rain. Purple is sleet. Blue is snow. Green is rain. Yellow and orange are moderate to heavy rain. This is the GFS model guidance. 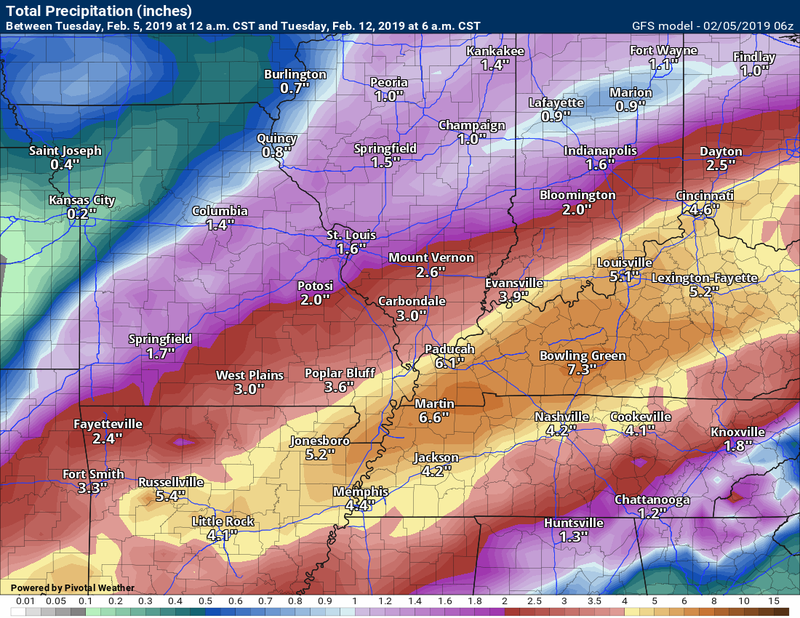 Now, let’s look at model guidance rain totals. Don’t take the specifics from these maps. Take the general idea of placement of the heaviest rain bands. 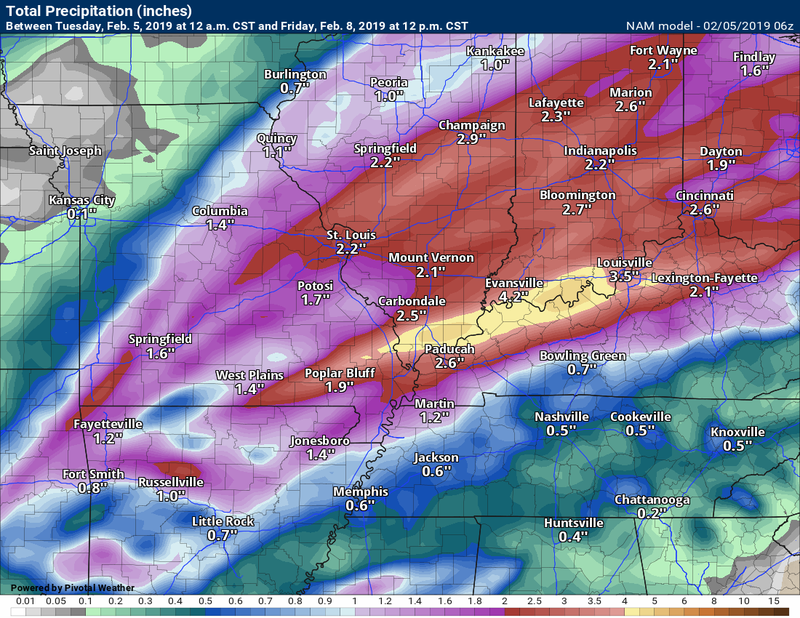 Almost all of the models show the heaviest rain along the Ohio River. A lot of moisture will be riding along this front. Copious amounts, as a matter of fact. Let me show you PWAT values. These are two to three standard deviations higher than normal. Above normal PWAT values. 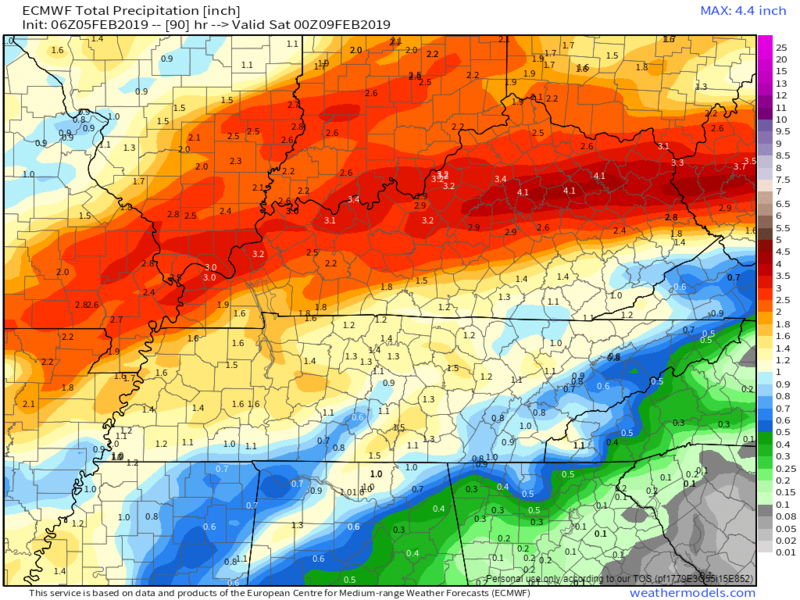 Another rain event arrives Sunday into Monday. It may begin as a wintry mix and then turn to all rain. That is the current forecast. Today’s image is the infrared satellite. You can see thick clouds over our region. Here is the latest WPC 6 to 10 and 8 to 14-day temperature outlooks. The blue colors indicate below normal temperatures. The darker the blue the greater the chance of below normal temperatures. The February update has been posted. Temperature forecast from the long-range team. Here is the preliminary March, April, and May temperature and precipitation forecast. Let’s look at the temperature anomaly forecast map from the long-range GFS model guidance. This graphic shows you whether temperatures are forecast to average above or below normal. Red shades indicate above normal temperatures. Orange and red indicate much above normal temperatures. Blue shades represent below normal temperatures. Purple to pinkish represents much below normal temperatures. The time-stamp is located in the upper left portion of the map animation. I bring these to you from the BAMwx team. They are excellent long-range forecasters. Remember, long-range outlooks are a bit of skill, understanding weather patterns, and luck combined. It is not an exact science. These products are for subscribers. .These products are for subscribers. To learn more visit their website. Click here. Previous episodes can be viewed by clicking here. We offer interactive local city live radars and regional radars. If a radar does not update then try another one. If a radar does not appear to be refreshing then hit Ctrl F5. You may also try restarting your browser. The local city view radars also have clickable warnings. During the winter months, you can track snow and ice by clicking the winterize button on the local city view interactive radars. Did you know that a portion of your monthly subscription helps support local charity projects? You can learn more about those projects by visiting the Shadow Angel Foundation website and the Beau Dodson News website. Remember, my app and text alerts are hand typed and not computer generated. You are being given personal attention during significant weather events. 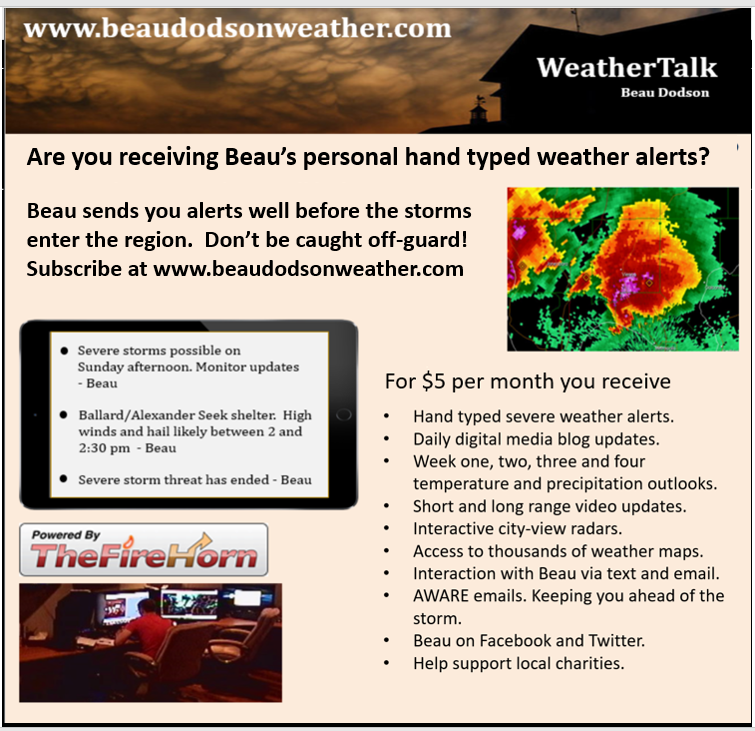 Beau Dodson is the meteorologist for the Southern Illinois Weather Observatory and for WeatherTalk LLC. 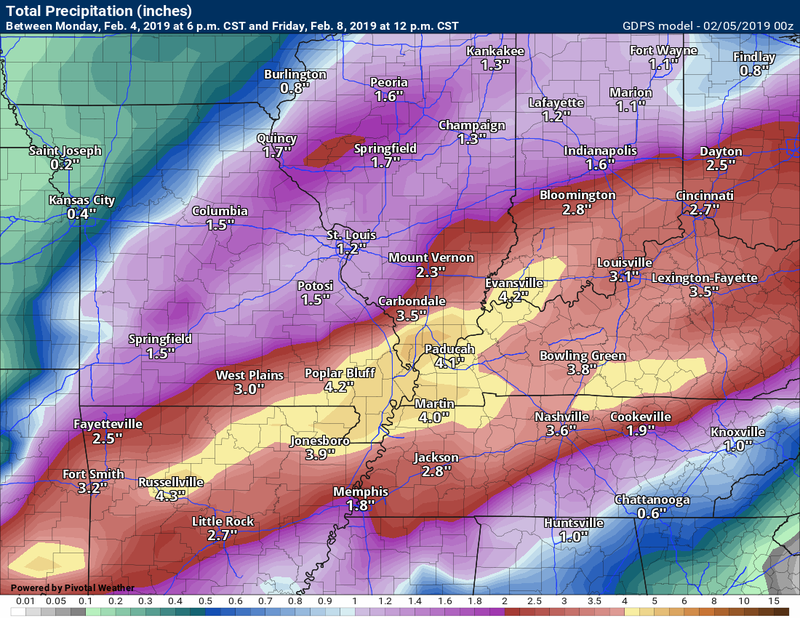 His forecasts cover portions of southern Illinois, western Kentucky, and extreme southeast Missouri. He is also the President of the Shadow Angel Foundation.